So I finally decided to overcome my laziness and put on some sideskirts! Naturally I keep a plethora of random Beretta parts up in the garage attic. Got to stock up since I’m hardly finding these things in the junkyard anymore. The sideskirt job was a long time coming. Easily over a year since I first had it in mind. Needed a flat surface for the underpinnings of the OEM Z04 kit found on any Beretta GTZs or Z26s of the same vintage. An angle grinder can solve so many problems. Next comes aligning, drilling and riveting in the bones. Also mid way, my rear-view mirror decides to fall off for no apparent reason. Whatever, now my car is a plethora of colors until I paint to match. 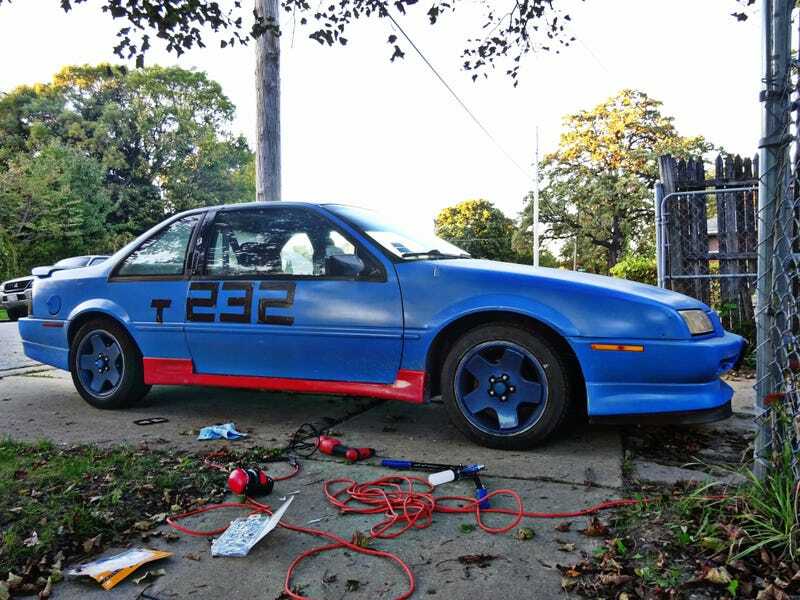 Also, using duct tape race numbers on rustoleum paint with zero clearcoat is a horrible, horrible idea. I usually use masking tape but all I could find at Walmart was the blue stuff which is a bad idea for a blue car if your trying to read the numbers. EIther way, mission accomplished. I’d say I’ve earned myself a beer!